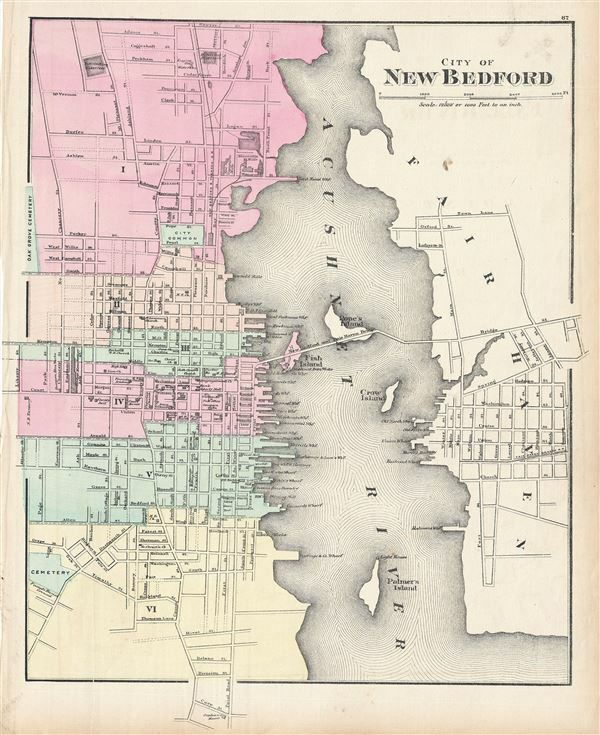 A lovely 1871 map of the city of New Bedford, Massachusetts, by H. F. Walling and O. W. Gray. Centered on Acushnet River, the map covers the city from Sawyer St. to Cove St. and from Oak Grove Cemetery to Summer St. Color coded according to wards, this highly detailed map notes several individual buildings, streets, bridges, islands, wharfs, cemetery and other topographical details. Published as plate no. 87 in the 1871 edition of Walling and Gray's Official Topographical Atlas of Massachusetts. Walling, H. F., and Gray, O. W., Official Topographical Atlas of Massachusetts, (Stedman, Brown & Lyon) 1871. Very good. A printing crease near bottom right margin. Map runs off edge of paper, as issued. Blank on verso. Rumsey 1154.025. Phillips (atlases) 14399.